Many aspects of party planning that go on behind the scenes. Food however is one of those things happening right in front of you. Once it is served, it is very difficult to try and make up for the fact that something doesn’t taste right or doesn’t look appealing. Selecting the right caterer can almost be as challenging and overwhelming as choosing the right menu. There are certainly a lot of caterers out there and each one no doubt is letting you know that they are the best and offer the best food and the best service. The best thing to do though is arm yourself with some great questions. This will help eliminate many of the unsuitable caterers. This then will allow you to focus on choosing the right one for your event among the few that matched your requirements. the food side of things but also the set up, cooking, serving and clean up. They will also have the knowledge with regards to timing your meal and knowing exactly how much food to prepare. than a sit down dinner compared to the number of guests that are eating. And finally, a last option is to have a cocktail reception or party with just hors d'oeuvres. These are usually less expensive and allow for guests to have more room to mix and mingle. Cocktail party menus may range from smaller canapé menu items to more substantial finger food such as satays etc. Moving along you will have to ask yourself what aspects of your event and menu are most important. Is it portions size? Variety? A certain type of cuisine? Made from scratch items? Organic and vegetarian options? A versatile caterer or personal chef will be able to work with you to make sure the menu is tailored to best suit your requests. Similarly, you should also make sure you hire a caterer who specializes in what you are looking for. It is true you often will get what you pay for. Hiring a BBQ caterer/chef may not be a great idea if you are hoping for a gourmet sit down diner. And hiring a Thai caterer may not be the best ideas if you want Mediterranean cuisine. 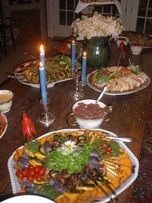 You should also find out if the caterer/chef has experience catering for your requested event. It may not be the best idea to hire a large event caterer if you are looking to host a fun small dinner party in your home. It also wouldn’t be a good idea to hire a caterer to cater a social function for 1000 guests if they have only ever had experience catering for up to 200. Just be sure to ask what there experience is regarding the type of event you wish to host. Next is the trust factor. You will want to hire someone who you feel is confident in their work as well as someone who holds true to their word. If they tell you they will send the menu for review tomorrow, and you don’t hear from them for a week, that may be a good indication they may not be the best caterer to work with. It is always a good idea to ask family and friends for referrals. You may also ask the caterer for references and testimonials. A professional caterer/chef should be happy to provide these on request. One of the best things you can also do is look on line for reviews. Here you will often find unbiased feedback and opinions. Meeting with the caterer before booking your event is also a great idea. Organizing your event will be much more pleasant when dealing with someone who you click with. Having a personable chef will do much to add to the experience and enjoyment of your evening. It is also always a good idea to find out what additional services the caterer provides other than just the food? Make sure you are clear on this before you sign any contracts. The last thing you want to do is sign a contract for a certain price only to find out later what it all did not include. You will want to ask if the price includes all food cost, service staff, set-up, required rental and clean up etc. There will sometimes be additional unforeseen expenses but the caterer should list what these possibly could be as part of their contract to you. With regards to menu, a good caterer should be able to work with you to come up with a menu that best suits your needs. If they just offer set menus it may be an indication of a lack of experience in cooking other options. Hiring a personal chef may also be a great option if you are looking at having a smaller dinner party that you wish to be specifically tailored to your individual requests. Questions to ask are what their specialty is? Are they also able to offer tailored menus to suit your individual likes and dislikes? Are they able to cater to specific dietary needs? Also ask if their menu items are made from scratch as sadly many caterers will simply use store bought items and will just jazz them up. If you are on a budget this may be your only option. But if you are paying good money then you will want to make sure your menu items are not store bought. One other thing to discuss with your caterer is the time line of your event. If you only have an hour host your event, requesting a 4 course sit down dinner may not be the best idea. Your caterer/chef should be able to help you with deciding what type of menu may be best suitable. The above list is certainly not everything to consider when hiring a caterer/chef but may it serve as a good guide to help guide you in the right direction. the food was beyond their expectations. could be that Chef Roman can cook for.